According to J. Evetts Haley 's account, Morris D. Jaffe had help from LBJ's connections in Washington to get his alleged uranium field certified as "rich" by the AEC. As the grandson of real estate investors, he was then able to buy up options to purchase adjoining lands in which he optioned off prior to the uranium crash, apparently to Climax Molybdenum Company (see article below). 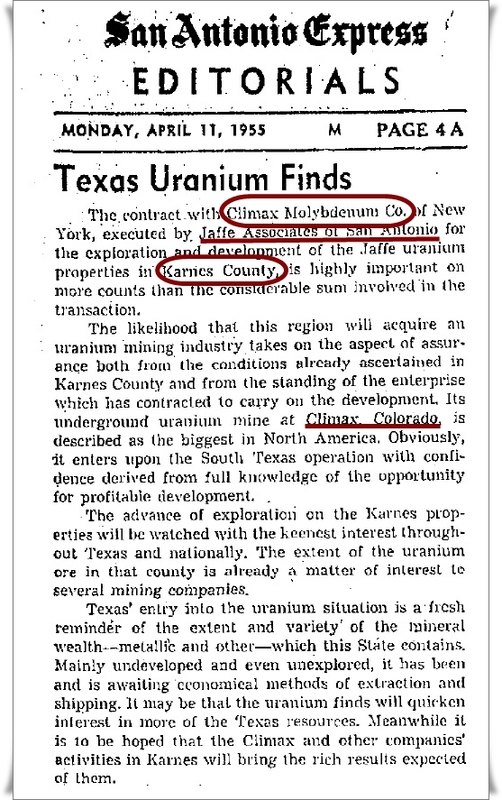 Whether or not Karnes County mines contained an abundance of uranium or not, they were actively worked for a time by strip mining, which brought molybdenum to the surface which ranchers claimed in 1977 had poisoned their cattle. From The Dealey Plaza Echo (2003). 7,2,30-39. 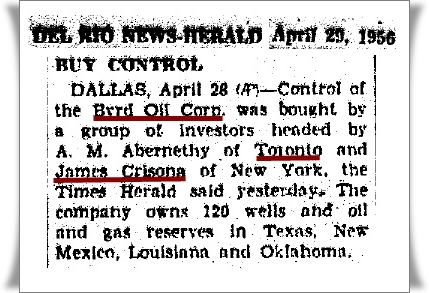 By mid 1953 it was reported that Byrd Oil Corp. had purchased two other Dallas corporations--McConnell Drilling and Anco Gas--the former engaged in exploration in the Rocky Mountains, and at about that time he had admitted publicly that he planned to do extensive development work during the summer in the Uintah Basin of Utah. He was quoted as saying the Clear Creek field was a "major discovery" being produced by Three States Natural Gas Co., which had recently merged with his former company, Byrd-Frost, Inc. Utah and El Paso Natural Gas Companies had requested permits in Utah to build a pipeline from that field to Salt Lake City. Jerrell Dean Palmer writes: "In 1952 the entrepreneur [Byrd] began to phase out Byrd-Frost and organized the Three States Natural Gas Company, which was purchased by Delhi-Taylor Oil Corporation in 1961." A University of Texas geology newsletter from 1956 stated: "Col. D. Harold Byrd is one of the most energetic and enterprising U.T. geology exes and one of the most active supporters of the University, which owes much of the Longhorn Band's appearance and activity to his assistance. He is president of the following four corporations in Dallas: Byrd Oil Corporation, Byrd Uranium Corporation, McConnell Drilling Corporation, and Colorado Carbonics, Inc. The fabulous role which Harold Byrd and Jack Frost played in discovering and developing the great East Texas Field is well known to most of the oil industry." After incorporation, the next step was to re-incorporate in Delaware and take the corporation public on the American Stock Exchange. 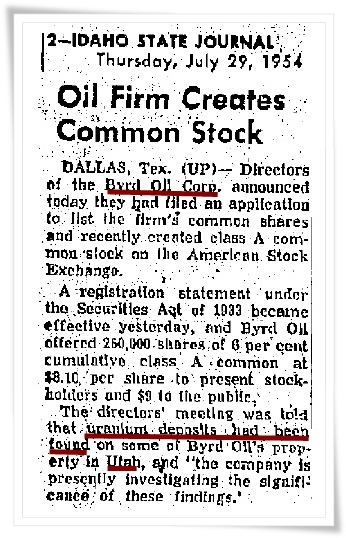 The United Press reported in mid-March of 1955: "Byrd Uranium Corp. had a new charter from Delaware Thursday making it a wholly-owned subsidiary of Byrd Oil Corp., President D. Harold Byrd said. The new company, authorized to operate in Colorado, Utah, New Mexico and Texas, will examine uranium prospects on the oil company's extensive holdings in the Rocky Mountain region." It would have been during this period of time that George De Mohrenschildt's resume reflects he worked for Three States Natural Gas in the Rocky Mountain area and in the Uintah basin. Byrd sold his own stock in the parent corporation, controlling interest in the uranium company, to A.M. Abernethy of Toronto, Canada, and James Crisona of New York. And that was the last we heard of that project touted by a right-wing member of the Dallas establishment. However, Williams' article mentions yet another uranium company in Dallas listed in directories, sharing a telephone number with companies owned by Morty Freedman. What he doesn't say is that D. Harold Byrd owned the 411 Elm Building, to which the Texas School Book Depository company moved in April 1963 from just across the street at 501 Elm, often called the Dal-Tex Building. 30. Cole's Criss Cross Directory. (1963). Cited in Goodman, p. 243. 31. Goodman, p. 176, p. 243. 32. Livingstone, H.E. (1993). Killing the Truth: Deceit and Deception in the JFK Case. New York: Carroll & Graf, p. 477. Morty Freedman began his career in Dallas as a manufacturer of women's belts (Marilyn Belt Mfg.) at 702-704 Main and 205 N. Record in Dallas (according to 1945 and 1948 directories of Dallas) as a dress designer (Mr. Eddie's dresses), and manufacturer of sportswear through his M&B Mfg. Company in Denton. He later owned a shoe factory in Denton named Den-Tex. 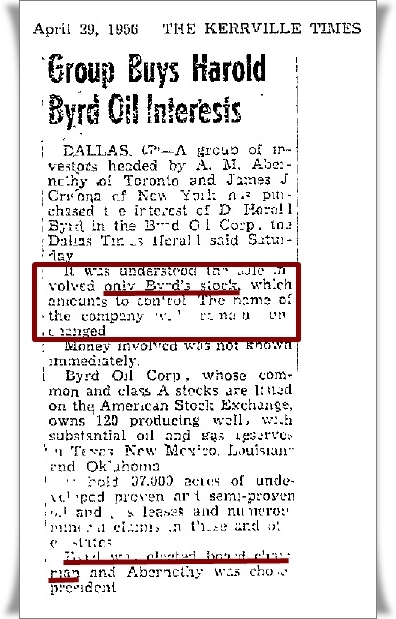 He also had numerous oil properties in the Abilene area, possibly purchased from the Byrd Oil Corp., since in 1955 he was president of Dallas Uranium and Oil Corp. in Denton. In 1958 the address of this uranium company was the 17th floor at 1309 Main Street (the Davis Building) in Dallas, TX, which had been the headquarters of the Republic National Bank for many years until 1954. For some reason, John DeLane Williams has indicated that Freedman's companies were located in the Dal-Tex Building (501 Elm St.), some 4 or 5 blocks west of the Davis Building. The co-owner of the Dal-Tex Building was David Weisblat, a major financier of the Anti-Defamation League, which has ties to Israeli Intelligence and is a key part of the Israeli lobby. The Israeli lobby hated Kennedy for going after it's [sic] nuclear arms program. The Israeli intelligence agency, Mossad, has close ties to the CIA. A number of firms in the Dal-Tex Building used the phone number of one Morty Freedman, who was active in the Zionist community and who was behind the Dallas Uranium & Oil Company, which was possibly helping Israel manufacture weapons. Freedman had other suspicious connections. Zapruder was a Zionist and a high-degree Freemason, as well as a member of two CIA front organizations and the business partner of [Jeanne de Mohrenschildt] the wife of Oswald's best friend in Dallas (Who was also CIA). He was a friend of the mother of Lyndon Johnson's secretary [Olga Fehmer, who spent many years working at Nardis in Dallas] and he was, through his CIA front groups, linked to the owner of the Book Depository [D. Harold Byrd? ], Oswald's Russian CIA friend [George de M? ], the woman who swore in Lyndon Johnson [Judge Sarah T. Hughes], the host of the 11/21 "Perp Party" where Lyndon Johnson promised to kill the Kennedys [Clint Murchison Jr], the likely supervisor of the Anti-Castro Cubans operation [?] and the shooting, an oil baron with a massive amount of connections to the assassination [? ], Bush's mentor [? ], and other suspicious people [?]. Bravo! And isn't it more than strange, that after 47 years, hardly anything is known about the Dallas Textile Mercantile Building? As the assassination investigation played out, it worked out great to have a grassy knoll diversion to take the focus off of the Dal-Tex. Info I've culled from a few sources is that: the 1963 owners were Morris J. Russ and David R. Weisblat. The 3rd floor was occupied by garment manufacturers Edward-Barry and Miller-Cupaioli. LBJ crony Morris Jaffe was a board member in both companies. He had made his fortune selling the South Texas uranium deposits to the Atomic Energy Commission during the 50's. The 4th & 5th floors were occupied by Abraham Zapruder's dress-making company, Jennifer Juniors. The 6th floor was shared by Marilyn Belt Manufacturing, lawyer Morty Freedman, and a front company named Dallas Uranium & Oil. All three shared the same telephone. The 2nd floor was apparently unoccupied in November 1963. The 1930 census shows that David R. Weisblat, born in Ohio in 1909 to Russian Jewish immigrants (Abraham and Frances Weisblat from Sapochow, Poland), was single and working as a salesman in Los Angeles for a dry-goods manufacturing plant and lived at the El Aro "bachelor apartments" near MacArthur Park. Death records indicate this same man died in Dallas, Texas in 1974. The Dallas Textile Mills were purchased by the Miller family--first operated by Clarence R. Miller (of 5112 Swiss Avenue), a bond broker in Dallas in 1930, and later by his son Giles E. Miller and Bryan C. Miller. Son Connell was killed in a car accident in 1954, two years after the two brothers had created a financial syndicate to purchase a football team called the New York Yanks, changed to the Dallas Texans (later sold to the Baltimore Colts). The Miller sons had both attended SMU around 1920. Giles Miller ran and lost a race for Congress as a Republican in 1962 and then, following the Supreme Court ruling in Reynolds v. Sims, he filed suit in Dallas County for redistricting and ran again in a special election when Rep. Robert Hughes announced his resignation. The Dal-Tex building has been identified by several authors as a possible site for one of the Kennedy-Connally shooters (34) Groden (35) identifies shot #1 at Zapruder-153, or Z-153) as a miss from the Dal-Tex Building, #4 as either from the Sixth Floor of the School Book Depository or the Dal-Tex Building, at Z-224, and another probable shot from the Dal-Tex Building. Wood (36) reports that the shot that missed and hit the concrete near James Tague likely came from the Dal-Tex Building (perhaps the second floor). Curiously, the work reported in Posner (37) indirectly supports the possibility of one or more shots emanating from the Dal-Tex Building. Cones of possible places a shot may have come from are drawn on page 477 in Posner's book. 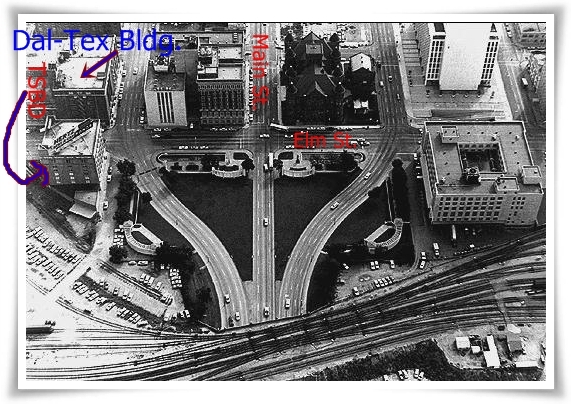 In that drawing, the Dal-Tex Building is conspicuously missing. Were the Dal-Tex Building included and the cones extended, much of the western end of the Dal-Tex building would be included in the cones. 34. For example, Benson, M.(1993).Who’s Who in the JFK Assassination: An A- to Z Encyclopedia. New York: Citadel Press; Benson, M. (2002). Encyclopedia of The JFK Assassination. New York: Checkmark Books; Goodman, 1993; Livingstone, H.E. & Groden, R.J. (1998). High Treason: The Assassination of JFK and the Case for Conspiracy. 35th Anniv. Ed. New York: Carroll & Gr af. 36. Wood, I.D. (2000). 22 November, 1963: A Chronology. In Fetzer, J.H. (Ed.) (2000). Murder in Dealey Plaza: What We Know now that We didn't Know then about the Death of JFK. (pp. 17- 118).Chicago: Catfeet Press. 37. Posner, G. (1993).Case Closed. New York: Random House, p. 477. 38. Roberts, C. (1994). Kill Zone- A Sniper looks at Dealey Plaza. Tulsa, OK: Consolidated Press p. 52 & p. 55. 39. Ross, R.G. (2001). The Elite Serial Killers of Lincoln, JFK, RFK, & MLK . Spicewood, TX: RIE. Ross's account is at least confusing. On p. 105, Ross reports that Braden may have been the shooter that hit Kennedy in the shoulder; Braden was said to be with a man with a walkie-talkie. On p. 117, Bocognini is the shooter accompanied by Braden. On pp. 265- 266, both Braden and Bocognini are identified as shooters. If both were shooters, was there another person with a walkie-talkie? 40. Benson, 1993: Blakely, G.R. & Billings, R.N. (1981). The Plot to Kill the President. New York: New York Times Books; Marrs, J. (1989). Crossfire: The Plot that Killed Kennedy. New York: Carroll & Graf; Russell, 1992. 41. North, M. (1991). Act of Treason: The Role of J. Edgar Hoover in the Assassination of President Kennedy. New York: Carroll & Graf; p. 308. 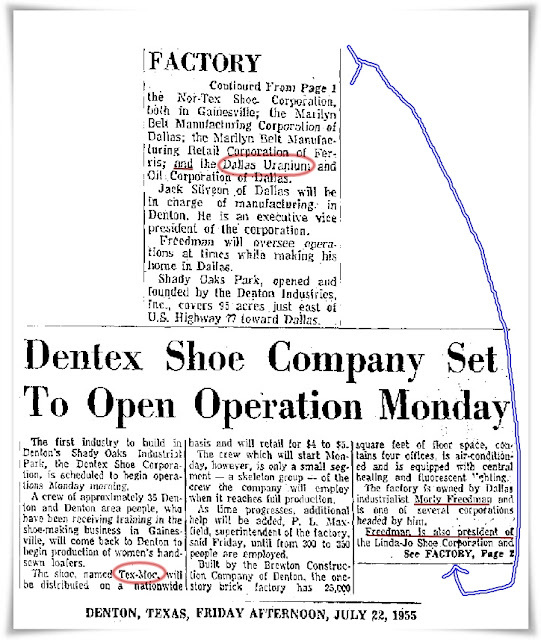 We'll pick up with Sam R. Bloom in a later blog post and will also follow up on Ian Griggs information at JFK Lancer Forum about the firms doing business in the Dal-Tex Building. Nice. When Bob Goodman and I laid out the 'JFK Today' we hoped someone would take the DUO ball and run with it. More interesting facts about the owner of the Dal-Tex building ... D.R. Weisblat. He also owned several businesses within 5 blocks of Dealey Plaza. Well-Made Novelty Co, and Well-Made Products. Those companies leased space in the Texas Schoolbook Depository. and his employees routinely went in and out of the building. Even more interesting is the fact that the Well-Made Product building later became the Dallas field office of the FBI for over 22 years. Thanks for previous comment. Maybe we should dig into D.R. Weisblat a little more? What was the address of Well-Made Products Building? ok this is all so interesting. I played in those buildings as a child. I went back and saw the Holocaust Museum. Did you know that David Weisblat was my grandfather. I know things I wonder if anyone would pay me for what I know? Michelle, everything I write comes from public records and secondary research materials. I never interview people because I don't trust hearsay. I do what I do for the love of truth--the belief in understanding our true, unvarnished history. I would hope that those who "know" things would disclose what they know for the same reason.